After the extreme cold blast last week, temps will slowly warm until tuesday when a warm front skyrockets temps well into the 30s for northern ME, 40s for mid/southern ME, NH, and MA with 50s+ southward. After this warmup, a cold front will drive temps down to below average levels similar to this past week. Next weeks cold will not be as bad as last weeks partly due to lighter winds. The cold will last through the weekend before slightly moderating at the end of the forecast period. No blockbuster snowstorms are in sight. However there will be a powerful low moving NE out of the Great Lakes mid week that will bring rain to the northeast as well as the midwest. Meanwhile, in the North Atlantic, there is an ultra powerful low pressure area that rapidly deepened yesterday and is approaching record territory. I expect the low to deepen to around 925mb or close to that. Data courtesy of weather underground’s weather historian Christopher Burt. 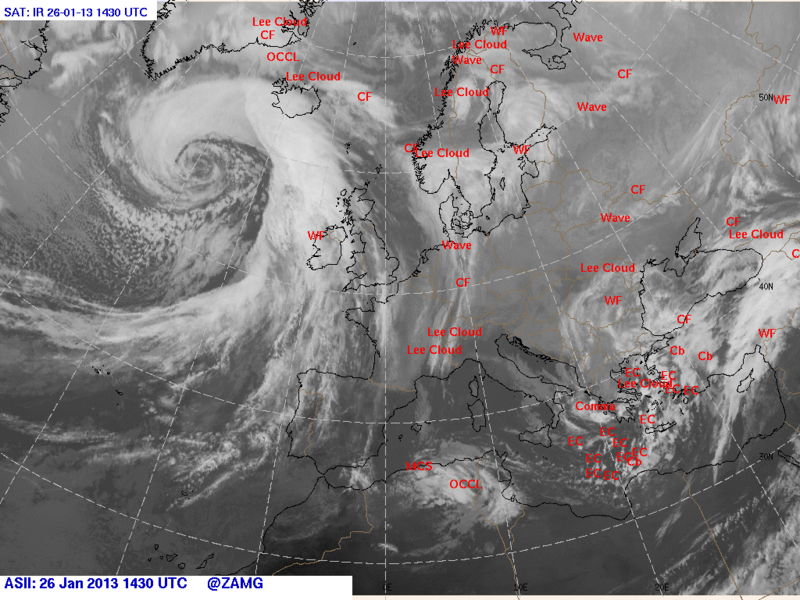 Here is this mornings satellite image of the storm named Jolle be Berlin University. After me missed out on the snow due to the fact that the feature called a norlun trough set up over the ocen not the coast, winds are picking up put of the north west ushering in cold air. Temperatures will drop tonight well below zero across the state of Maine as well as northern NY, northern VT, and the northern half of NH. MA, and southern NH, VT and NY will get to the single digits or slightly below zero. Cold air will stick around tomorrow with highs barely reaching 10 across ME and the teens across most of New England. The cold hangs on this week with a chance for some light snow across southern New England on friday bringing with it moderating temps for the weekend. No major storms are in sight for the next two weeks. Sadly the norlun trough is a little weaker and farther east with the heavy snow over the ocean not land. To determine new totals simply cut in half what was previously. Another storm on friday will go out to sea with moderating temps next weekend. In all, a real January snow bust. This mornings models are less favorable for snow. 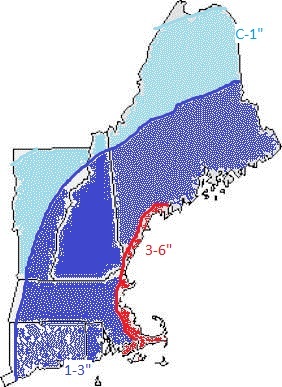 The low will move too far to the SE to really bring us much beyond 3-6″ at the immediate cost from about Brunswick ME to Portland to Kittery to Boston MA to the Cape Cod canal towards the coast. There will be an inverted trough that will set up over coastal ME/NH/MA tomorrow that will enhance snowfall there. It looks like winds will not be as active as previously thought. Winds will be light out of the N/NW. It looks like the friday storm will be too far out to sea to dump much snow at all. As New England reels from a disasterous AFC championchip game, us snow lovers can look forward to the snow potential for Tuesday. There is an upper level disturbance currently over the midwest moving to the east that will develop a low pressure area off of Cape Cod. This disturbance will move to the northeast while deepening. There will be an inverted or Norlon trough that will likely set up along the I95 corridor from Brunswick ME to Boston MA. Along this trough axis is where totals of 3-6″ are possible. Amounts of 4-8″ cannot be ruled out. I am not a very good lake effect snow forecaster but included those totals as well because southern NY will be effected by the coastal system. Winds will become potentially gusty out of the NE/N/NW depending on your location. More snow possible for Friday. After a January thaw of sorts, the cold air will return; with vengeance. A cold front will sweep across the area today lowering temps to seasonable levels. Wednesday there is a possibility for some light snow in the south but nothing much. Thursday, an arctic cold front sweeps south bringing below average temps. A warm front moves north Saturday followed by a strong cold front sunday. as for any snow chances, there could be snow squalls associated with any of the cold fronts most likely not todays. The PNA will move + which is bringing in cool air however models are split down the middle on the AO/NAO but it does not look like any major snow events are in the forecast. After a period of chilly weather across the eastern third of the country, there is a warm up in store. This warm up will arrive in the next few days lasting until mext weekend. 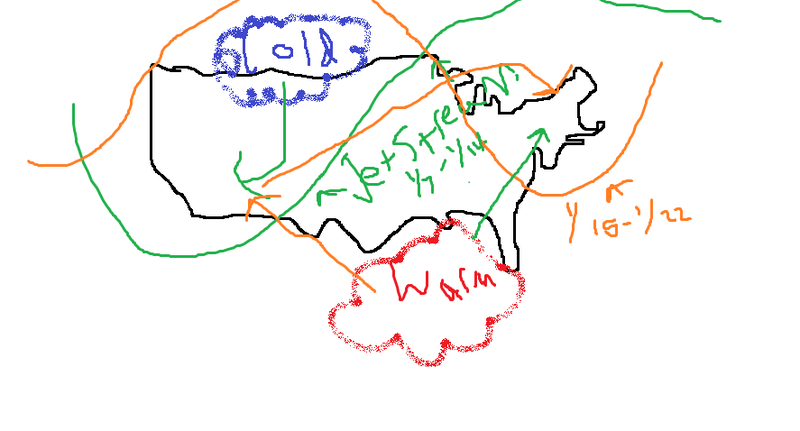 The week after next the jet stream will dive south bringing in cooler, stormier weather. More on this later. Apologies for rather bad graphic. Computer error 😦 Orange/green lines represent the Jet Stream for dates shown on graphic 1/5-1/14 for green 1/15-1/22 orange.